When planning your wedding, your guests enjoyment is probably at the top of your list. Not only do you want to enjoy every minute of your day, but you want your guests to have a wonderful time as well. Delicious food, a good bar and an engaging band or DJ are all key to a great celebration. However, if you want to create a truly memorable day for you and your guests, you’ll want to personalize your entertainment. Entertainment doesn’t just refer to your band or DJ anymore. Wedding entertainment now spans all art forms and can add that extra special touch to your big day. 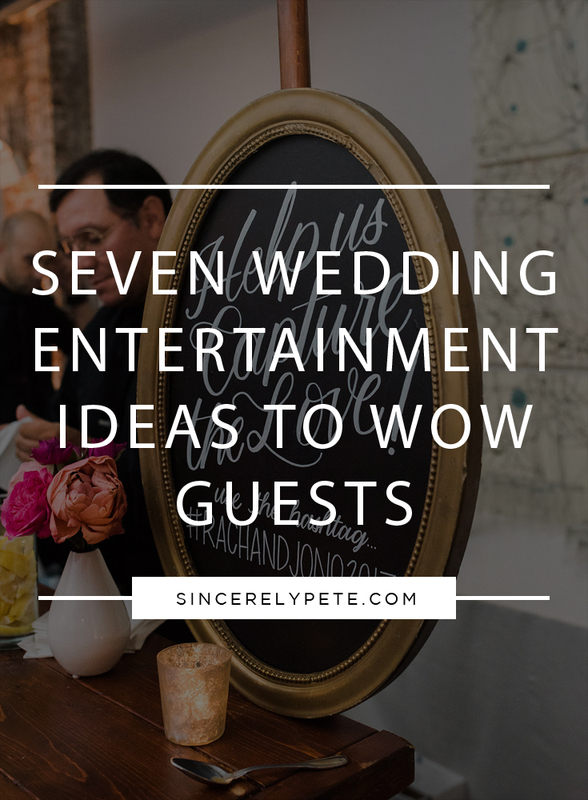 If you’re looking to take your wedding to the next level, here are our favorite entertainment ideas that you and your guests will love. #1 - Live Painting: A live painting is a great way to entertain your guests and commemorate your wedding. An artist arrives at your wedding and paints a memorable moment such as your ceremony or first dance in real time. Guests can watch as the artist captures the occasion on canvas and at the end of the night, you’ll have a one-of-a-kind way to remember your big day. #2 - Silhouette Artist: If you can find one, silhouette artists are a fun addition to your wedding. Guests can sit by themselves or in pairs as the artist hand cuts silhouettes. Most will cut two at a time so one can go home with your guest as a favor while the other goes in a guest book for you. It’s a favor your guests will actually love and guest book you’ll actually look at. #3 - Surprise Late Night Food Trucks: After all the dancing, drinking and celebrating, your guests are bound to be hungry. Surprise them with a late night appearance from a local food truck serving up nostalgic favorites. #4 - Onsite Calligrapher: Much like the silhouette artist, an onsite calligrapher is a personal, beautiful alternative to your traditional guest book. Guests can have the calligrapher write their congratulatory messages and well wishes which you can then place in a book. You could even frame a few to display on a gallery wall in your new home. #5 - Cigar Roller: If you like smoking a celebratory cigar, a cigar roller is the perfect addition to your wedding. Work with the torcedores (a person who rolls cigars) to create a custom blend for your wedding. He or she can then hand roll on site for guests to enjoy then or take home to remember the night. You can even save a few to celebrate your first anniversary. #6 - Cultural Act: Embracing your heritage is a great way to make your wedding feel more personal. It’s also a great way to entertain your guests. During dinner or the band’s intermission, have a group perform traditional dances or play music local to the region. It will be a delightful surprise for your guests. #7 - Specialty Tasting Bar: Take your wedding bar to the next level by featuring a specialty tasting bar of your favorite libation. Have an expert man the tasting bar to answer all of your guests’ questions while sampling. You can even take it the next level by pairing well matched foods with each sample. What unique ways do you plan to entertain guests at your wedding? Sincerely Pete is a full-service wedding planning and design company in Washington, D.C. and Alexandria, VA who believes in a personal, curated & customized approach to each wedding couple we work with, taking their values & personalities into account and keeping the relationship as the focus of the wedding. We plan Washington DC weddings, Virginia weddings, Maryland weddings and destination weddings all over the world. modern & timeless. creative & curated. infused with meaning. implemented with love. Sign up to receive news, inspiration and updates delivered to your directly to your inbox!